His Holiness Swasti Sri Bhattakalanka Bhattaraka Swamiji of Sonda (Swadi) Jain Mutt passed away this morning at around 11.30 am. Aged around 92 years, Sri Bhattakalanka Swamiji was the eldest among all the Bhattarakhas across India. He died of heart attack while offering mantra akshate to the devotees. He hailed from the Hosur village of Kundapura Taluk in Udupi district of Karnataka. 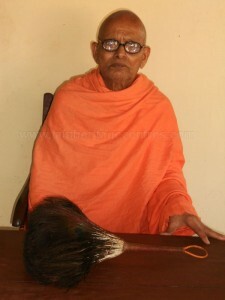 Further he had been the Bhattarakha of Sonda Jain Mutt since 1975. Sonda is a small village in the Sirsi Taluk of Karwar district. It is situated in the abode of nature's beauty at a distance of 22 Kms from Sirsi in Karwar District. It is in the middle of the thick forest. Sodhe or Sonda or Swadi flourished prosporusley during the reign of Vijayanagara Empire and is a considered to be a sacred place by both Hindus and Jains. It was the headquarters of Sonde rulers who were feudatories of Vijayanagara. We can also find a samadhi of Jain Muni Bhattakalanka. The Jain mutt here is headed by Swasti Sri Bhattakalanka Bhattarakha Swamiji and the Bhattarakha seat is called as Akalanka peetha. An ancient temple dedicated to Bhagwan Rishabdeva is annexed to this math. The idols of Bhagwan Chandraprabh and Bhagwan Bahubali are also installed in this temple. Around the Jain mutt there are 6 ancient Jain temples and are worth visiting. His Holiness Swasti Sri Charukeerthi Bhattarakha Swamiji of Shravanabelagola Jain Mutt, His Holiness Swasti Sri Bhuvanakeerthi Bhattarakha Swamiji of Kanakagiri Jain Mutt and His Holiness Swasti Sri Devendrakeerthi Bhattarakha Swamiji of Humcha Jain Mutt have conveyed their condolences. Further Dr.H.A.Parshwanath, Jain scholar & professor of pathology S.D.M.Medical College, Dharwad, Sri Y.C.Bhujabalaiah, executive committee member of Karnataka Jain Association. Sri M.R.Sunil Kumar from Digambar Jain Samaj, Mysore& Sri Nitin H.P., executive director, WWW.JAINHERITAGECENTRES.COM have also conveyed their condolences.